Shinobu Wakiyama ~ the Karuta Assassin. I was already looking forward to this episode because there has been some interesting build up. 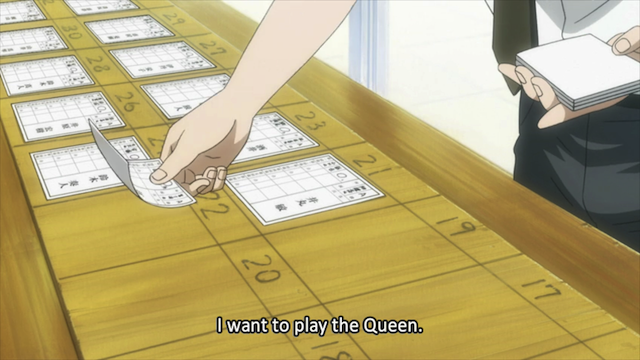 Chihaya has wanted to be the Queen, the strongest female Karuta player, since she was in grade school. 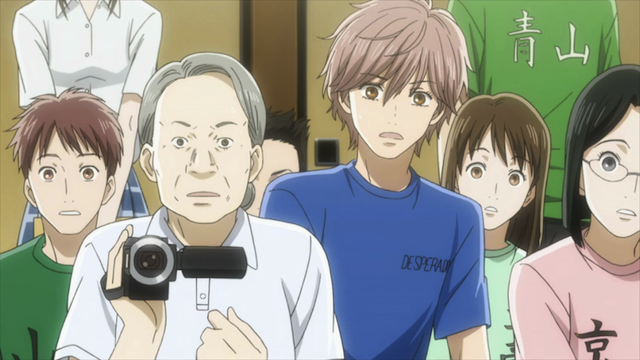 As exciting as some of the team mechanics were, episode 14 of Chihayafuru finally returns us to one-on-one matches, and the ultimate rival appears. I was on edge almost the entire episode, and for the first time (and in the exact right game) a match isn’t concluded before the end of the episode — cliff hanger! In many respects this episode was all about the reigning Queen, so she will be the focus of this post as well. Karuta matches are selected at the Omi Jingu National Championship. 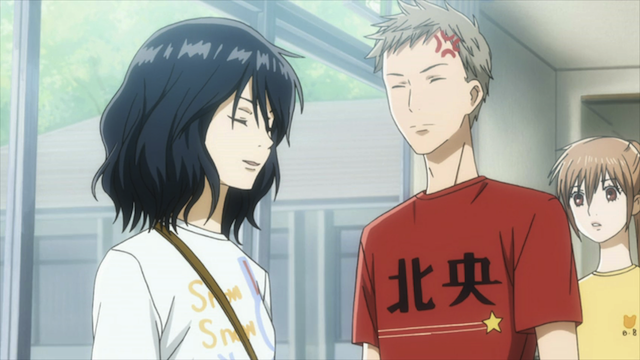 Left to right: Wakamiya Shinobu, Akihito Sudou, and Chihaya Ayase. In my opinion, the Queen is an excellent character. 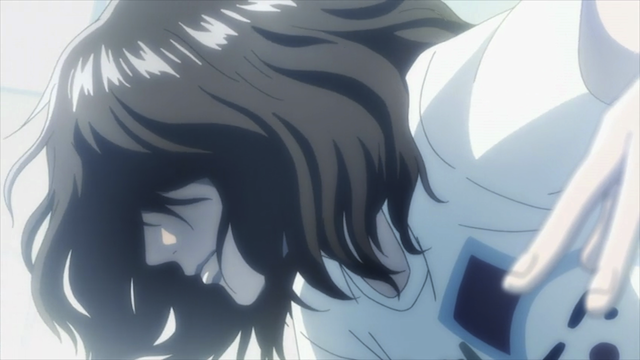 They did some build up, so we knew she was good at Karuta, but this episode managed to show a number of contradictory sides of her, which made her intriguing. To start off, we have her formal introduction. Sudou, the captain of the team that represented Tokyo several years in a row is on hand to provide commentary, such as her being the youngest Queen in Karuta history, and that she made A class when she was still in the fourth grade. But her comments about how tough an opponent she will be are then undercut by comments from the crowd, saying that she has the “fashion sense of a rock”. 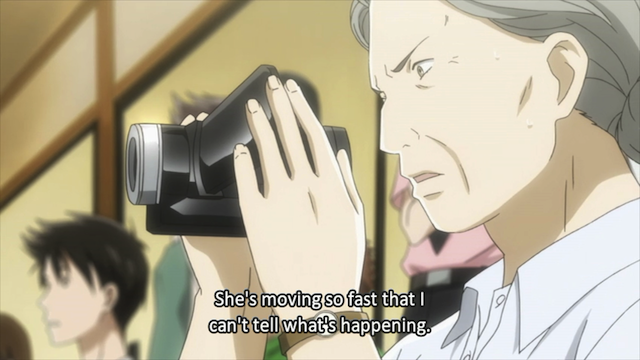 This kind of complex characterization is one of the incredible strengths of Chihayafuru. 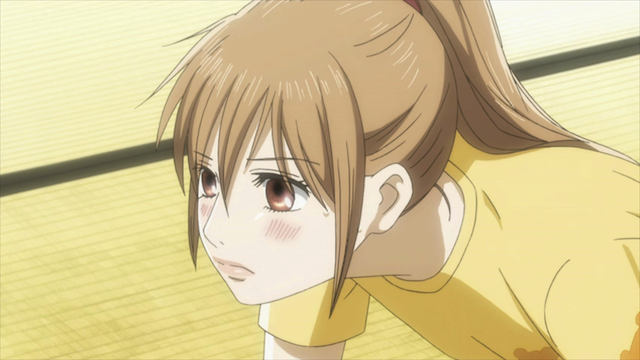 Chihaya faces an opponent on the tatami mats. There are several other examples of this complexity. Chihaya, for example, is a wonderful combination of nobility and goofy dork. Another great example is Taichi, whose failings and strengths are both constantly on display. Wakamiya Shinobu. She may be a deadly assassin, but obviously she isn't all bad. In the midst of everything, the two opponents almost bond over their chosen character T-shirts. 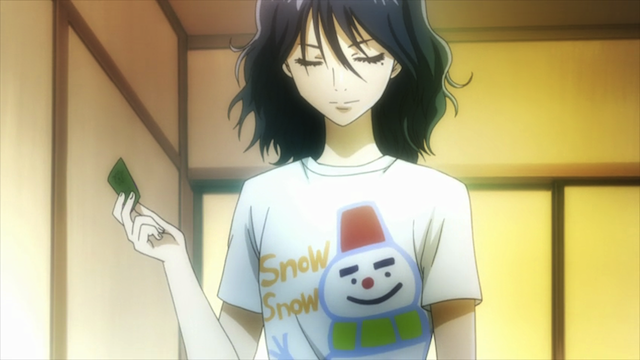 Chihaya realizes that the Queen is wearing a rare Snow-maru T-shirt. 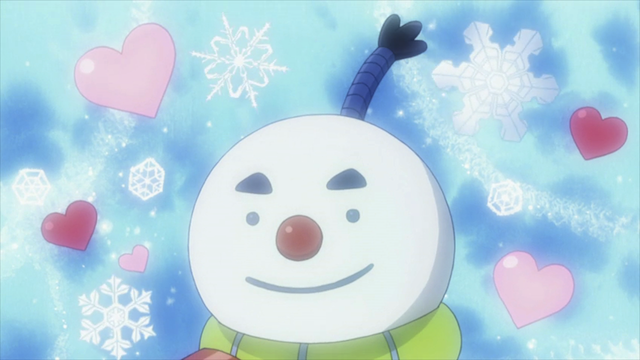 Snow-maru is a character that wears a fez to cover his top braid. ??? Smow-maru shows off his top braid. But this turns out to be only a momentary diversion in the midst of a heated battle. Chihaya Ayase battles the Queen, Wakamiya Shinobu, in a Karuta match. And here we get to another interesting aspect of the Queen, her name and the nature of her Karuta. Shinobu actually means “stealth” in Japanese, and is a form of the word that is often used instead of Ninja (Shinobi). Meanwhile Queen Shinobu’s playing is so fast that it can’t be seen. 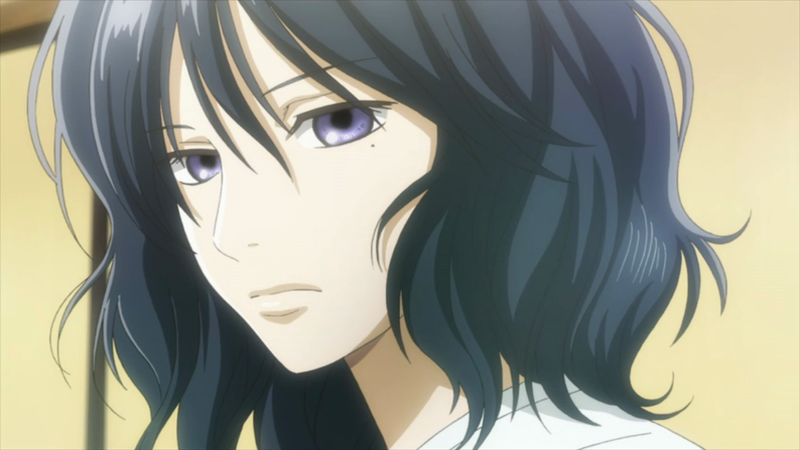 Chihaya calls it “Silent Karuta”. The ninja moves in for the kill. I like the way they dealt with this in the anime. 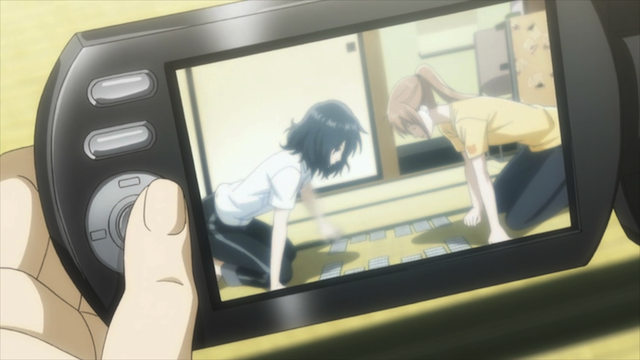 In addition to effective use of changes of tempo (that is the actual card taking is very fast, and then there is a slow motion tumble of the card), the teams adviser and Taichi use a video camera to do slow motion replays to try to figure out what happened after cards are played. Great expression on the teacher here. The ninja's arm is moving too fast to be captured by ordinary technology. This entire match had me bunched up in knots. I kept feeling the tension, and had to keep reminding my body to stop clenching up. What this show needed was a real nail-biter of a game, and this was the perfect opportunity. Chihaya is up against the Queen, and she is losing badly. And to top it all off, we have a cliff-hanger. Is Chihaya going to be able to hold on? We’ll have to tune in next week to find out. Queen Shinobu is amused that you are still willing to fight. I was really caught up in this episode too! I remember feeling so happy when Chihaya took her first card – her first, legitimate, no contest, card! 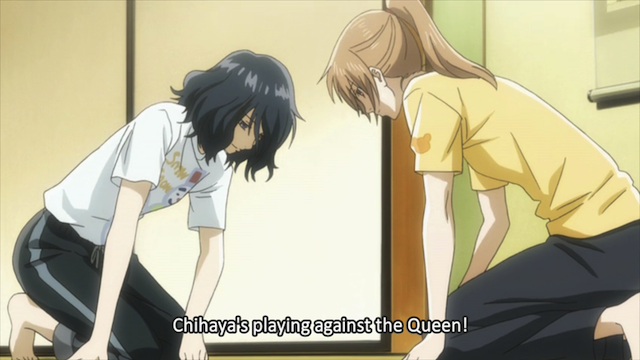 Chihayafuru’s pacing is so well done and even though it ended on a cliffhanger, I can’t imagine it ending any other way; this way it builds up to the penultimate moment next week when we find out the results of the match between Reigning Queen and Want-to-be-Queen. reading your review was really refreshing because when I watched this episode, I couldn’t help but think of the Queen as a mere side character; for me, this episode was all about Chihaya. well I mean it’s always about Chihaya, but this was like the heart, soul, blood, sweat, and tears of Chihaya. using Sudo and Taichi as narrators was also brilliant because they’re the most apt people to understand (and explain) the game as well as the players who are playing the game. Well I completely agree with you. 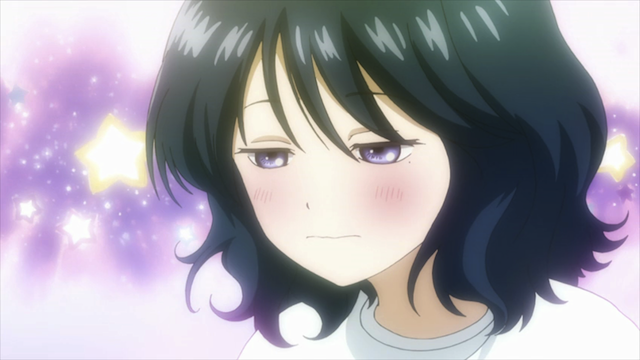 Chihayafuru is so well conceived and executed that it makes slogging through the new series difficult. They just don’t seem very good in comparison. I like the way they use the bystanders to comment as well. The knowledgable ones. like Taichi, give interesting insights into the game, and then they also had the teacher’s reactions of shock and confusion. She doesn’t know enough about the game to give expert commentary, but she was used well to build up the tension. Having her scowling and unable to tell what happened even when replaying the video helped to give Shinobu’s deadly skills a sense of mystique and give the impression that Chihaya’s situation was out of control. I’m so glad that they handled this match with a cliffhanger. This was the match that really deserved that treatment. Considering that the teacher is (primarily) a tennis coach — a game not noted for the slow reflexes of its participants — makes her astonishment at the Queen’s speed even more impressive. The Queen is fascinating, and not entirely unsympathetic. When she voices her regret at the tendency of her opponents to simply fall apart under her assaults, you get the strong impression both that she feels genuine sympathy for them and that she longs for a worthy opponent. (Aren’t martial arts masters ALWAYS searching for worthy opponents?) I can see Shinobu and Chihiya becoming either bitter enemies OR best of friends. God this show is good. I think Chihiya will lose THIS match. It would be too unbelievable if she didn’t, and I think this show is too well written for that. But there are many episodes and much story left to tell. I agree. 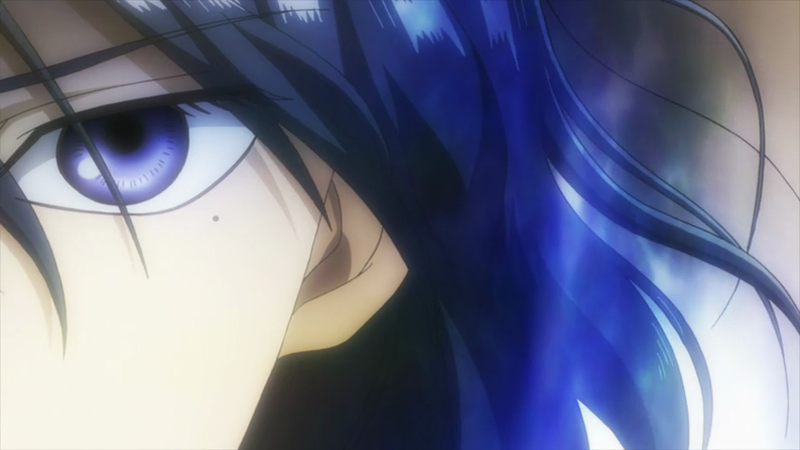 It is most likely that Chihaya will lose the match, but show a decent struggle to the finish. After which there will be some confirmation from the Queen that she considers Chihaya a worthy rival (perhaps something as simple as Arata’s “That was fun”). Heh, I’m getting pumped up just thinking about it! Wow! I just watched this episode again in 1080p from Crunchyroll, and it looks AMAZING. Though I did notice a little stuttering a couple of times. Still…BOOYA!!! Who do I have to kill to get this show on BD?????? I would love to get a real copy of this show, but I’m not holding my breath. I don’t have a TV that supports 1080p, so I can’t even imagine the difference.